Is your cat peeing outside the litter box, scratching or hiding? These behaviors are likely caused by fear and anxiety. FELIWAY CLASSIC products are a clinically proven, drug-free solution to help alleviate many of the unwanted behaviors cat owners deal with. FELIWAY CLASSIC refills provide "happy messages" to cats to make them feel calm and comfortable at home. By mimicking the natural feline reassuring messages (pheromones), FELIWAY CLASSIC helps cats happily adjust to pace of modern life. 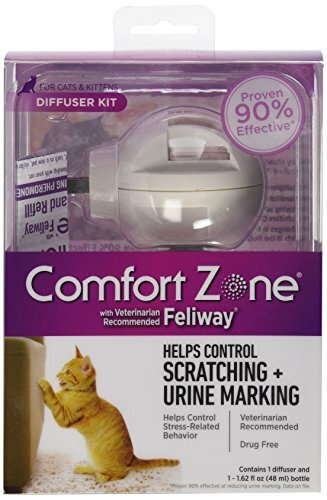 Use FELIWAY CLASSIC refill vials along with the FELIWAY CLASSIC diffusers (sold seperately) if your cat shows signs of discomfort like peeing outside the litter box, hiding, or destructive scratching. Reduces urine spraying in 9/10 cats. Can see results within 7 days. You may also consider if you anticipate changes in your home (moving, renovation, redecorating, arrival of a new pet, arrival of a new family member). Use the diffuser in the room where your cat spends the most time. FELIWAY CLASSIC Refill vials include one refill vial (diffuser head sold seperately).It is recommended to replace the refill every 4 weeks, even if a small amount of liquid remains in the vial (the vial will never be completely empty). #1 brand used and recommended by veterinarians. Clinically proven to work. Reduces urine spraying in 9/10 cats. Can see results within 7 days. Drug-free solution that helps reduce signs of stress such as peeing outside the litter box, scratching and hiding. CLASSIC Refill includes one vial per package that lasts up to 30 days (diffuser head sold seperately). 100% satisfaction guarantee. 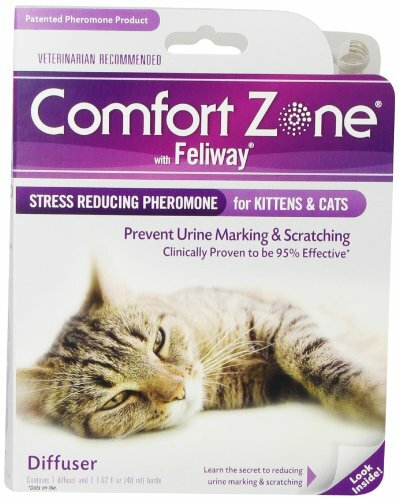 Feliway Wipes are your solution to help you calm and control your anxious cats.Feliway Wipes use pheromones to create a natural and convenient way to calm your cat. Feliway wipes are easy to use and contain the same ingredients as Feliway spray for a low cost way to treat feline stress, thereby preventing stress related issues such as eating disorders, Feline interstitial cystitis, and feline psychogenic alopecia. Feliway Wipes are a spot on solution that will leave your cats calm and collected. Feliway wipes are disposable and allow you to create particular spots that your cat will find comforting. This allows you to create trails and place for your cat to stay. These wipes can also be used to make trips to the veterinarian much easier and can make a cat comfortable before going to bed. Order Feliway Wipes for your cat today! Calming travel wipes mimic a cat?s natural facial pheromones, which creates a state of familiarity and security. Use them to wipe down hard surfaces like his carrier, plane surfaces, car dashboard or console, and more. Comes in individually wrapped, single-use sachets for convenience and ease of use. Veterinarian recommended and clinically proven to have calming results. Re-apply every four to five hours, and you've got stress relief on the go. Is your cat peeing outside the litter box, scratching or hiding? These behaviors are likely caused by fear and anxiety. FELIWAY CLASSIC products are a clinically proven, drug-free solution to help alleviate many of the unwanted behaviors cat owners deal with. FELIWAY CLASSIC refills provide ?happy messages? to cats to make them feel calm and comfortable at home. By mimicking the natural feline reassuring messages (pheromones), FELIWAY CLASSIC helps cats happily adjust to pace of modern life. 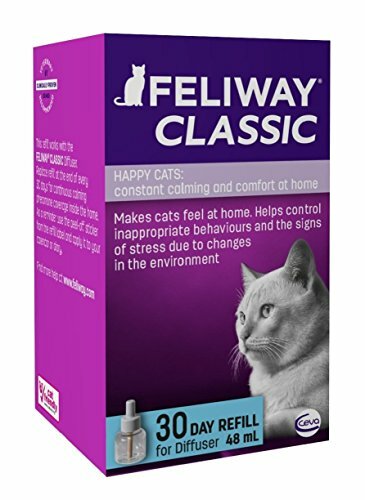 Use FELIWAY CLASSIC refill vials along with the FELIWAY CLASSIC diffusers (sold seperately) if your cat shows signs of discomfort like peeing outside the litter box, hiding, or destructive scratching. Reduces urine spraying in 9/10 cats. Can see results within 7 days. You may also consider if you anticipate changes in your home (moving, renovation, redecorating, arrival of a new pet, arrival of a new family member). Use the diffuser in the room where your cat spends the most time. FELIWAY CLASSIC Refill vials include one refill vial (diffuser head sold seperately).It is recommended to replace the refill every 4 weeks, even if a small amount of liquid remains in the vial (the vial will never be completely empty). #1 brand used and recommended by veterinarians. Clinically proven to work. Reduces urine spraying in 9/10 cats. Can see results within 7 days. Drug-free solution that helps reduce signs of stress such as peeing outside the litter box, scratching and hiding. CLASSIC Refill includes one vial per package that lasts up to 30 days (diffuser head sold seperately). 100% satisfaction guarantee. Is your cat peeing outside the litter box, scratching or hiding? These behaviors are likely caused by fear and anxiety. FELIWAY products are a clinically proven, drug-free solution to help alleviate many of the unwanted behaviors cat owners deal with. FELIWAY CLASSIC provides ?happy messages? to cats and makes them feel calm and comfortable at home. By mimicking the natural feline appeasing messages (pheromones), FELIWAY CLASSIC helps cats happily adjust to pace of modern life. Use FELIWAY CLASSIC Starter Kit if your cat shows signs of discomfort like peeing outside the litter box, hiding, or destructive scratching. Reduces urine spraying in 9/10 cats. Can see results within 7 days. You may also consider if you anticipate changes in your home (moving, renovation, redecorating, arrival of a new pet, arrival of a new family member). Use the diffuser in the room where your cat spends the most time. Plug the diffuser in an electric socket with a minimum clear distance above the diffuser of 5 ft. (The vapor carrying the FELIWAY messages rises in a column of warm air above the diffuser). One diffuser covers up to 700 sq. ft. You may need to use more than one diffuser for a large or multi-floor home. Be sure to replace your diffuser every 6 months and refill vials every 4 weeks. It is recommended to replace the refill every 4 weeks, even if a small amount of liquid remains in the vial (the vial will never be completely empty). #1 brand used and recommended by veterinarians. Clinically proven to work. Reduces urine spraying in 9/10 cats. Can see results within 7 days. 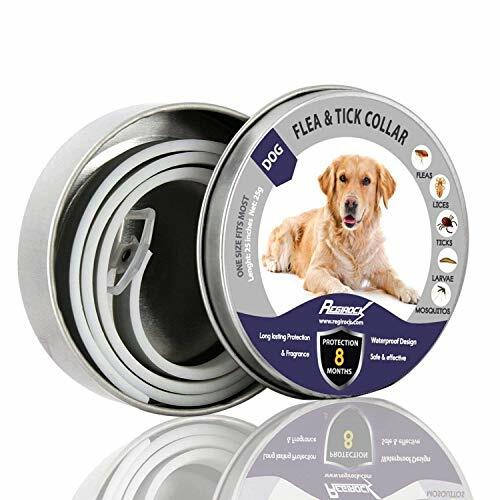 Drug-free solution that helps reduce signs of stress such as peeing outside the litter box, scratching and hiding. FELIWAY CLASSIC Starter Kit includes one diffuser head that lasts up to 6 months and one vial that lasts up to 30 days, covering an area up to 700 sq. ft. 100% satisfaction guarantee. Are your cats fighting or showing tension in your household? FELIWAY MultiCat products are a clinically proven, drug-free solution to help alleviate many of the unwanted behaviors cat owners deal with. FELIWAY MultiCat sends ?harmony messages? to cats and restores harmony between cats living together. By mimicking the natural feline appeasing messages (pheromones), FELIWAY MultiCat helps your cats live in harmony and avoid tension, conflict and fighting. Cat owners saw a 70% reduction in conflict in 3 weeks. Use FELIWAY MultiCat Starter Kit if you have 2 or more cats living together and if they show signs of tension like chasing, blocking, staring. Use the diffuser in the rooms where your cats spends the most time. Plug the diffuser in an electric socket with a minimum clear distance above the diffuser of 5 ft. (The oily vapor carrying the FELIWAY messages rises in a column of warm air above the diffuser). One diffuser covers up to 700 sq. ft. You may need to use more than one diffuser for a large or multi-floor home. Be sure to replace your diffuser every 6 months and refill vials every 4 weeks. It is recommended to replace the refill every 4 weeks, even if a small amount of liquid remains in the vial (the vial will never be completely empty). #1 brand used and recommended by veterinarians. Clinically proven to work. Can see results within 7 days. Drug free solution that helps reduce conflict between cats living together. It may help decrease fighting, chasing, blocking and staring. FELIWAY MultiCat Starter Kit includes one diffuser head that lasts up to 6 months and one vial that lasts up to 30 days. 100% satisfaction guarantee. Stock up on refills for your Feliway Plug-In Diffuser (sold separately), and maintain a state of security and familiarity to help your cat cope with a new environment. Just plug the Feliway Diffuser into any electrical socket. Much like a plug-in deodorizer, the Feliway Diffuser emits a synthetic cop of your cat’s natural facial pheromone, used by felines to mark their territory as someplace safe and secure. Oil vapor carrying the pheromone will rise in a column of warm air above the Diffuser and prevent your kitty from urinating to mark its territory. Using pheromonatherapy to help sooth your pet is a new field in veterinary medicine. This scent in a room will help reassure your cat while it copes with a challenging new situation. If the Diffuser is being used to help reduce or prevent another behavioral or medical problem, plug it in the room where your cat spends most of its time. Do not cover it, or place it behind a door or beneath furniture. Will cover an area of 50 to 70 square meters and last up to 4 weeks.